“The University is a significant heartbeat in our city, and our region, and we take seriously the responsibility we have to drive the economic, social, cultural, educational and environmental prosperity of our home. “We recognise the role we have to play is very much a civic one, and we aim to fulfil this responsibility by engaging with, and offering support to, community groups and members of the general public, so that we can work together to create opportunities, open doors and enhance lives. Our public engagement activity supports this ambition and is intended to have a positive impact on the local communities and people within our region. The programme of activity continues to evolve as we identify community needs, and develop our understanding of the role we can play in responding to them. 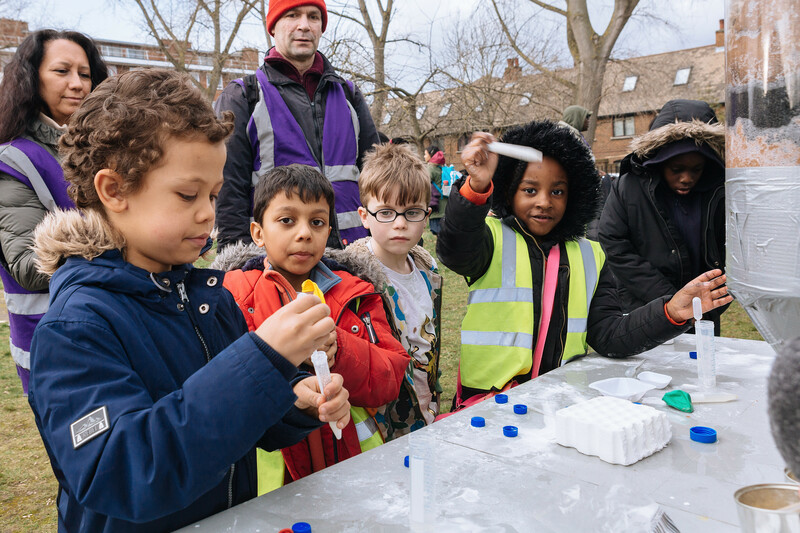 Public engagement plays an integral role in the research programmes of our academics; from encouraging public participation in applied research, to facilitating people’s engagement with our researchers at international festivals, public lectures and educational events. Activities have included enabling conversations with new mothers and medical professionals about birthing experiences; promoting established and upcoming artists through the FORMAT photography festival; and encouraging young people’s engagement with the world’s endangered coral reefs through outreach to schools and museums. Education is an important driver of social mobility and Derby has a strong track record in widening participation in Higher Education. Nearly 21% of our full-time first degree undergraduates are from the lowest Higher Education participation neighbourhoods and are often the first member of their family to go to university. UK-domiciled black and minority ethnic (BME) students make up 20.8% of our undergraduate body and 97% of our undergraduates are from state school backgrounds. In October 2016 social mobility was identified by the Department for Education as a local priority for Derby and the city was designated as an Opportunity Area. Professor Kathryn Mitchell chairs the local Opportunity Area board and is working with schools and organisations across the city to help young people reach their potential. We also work closely with local schools and deliver a range of activities, presentations and workshops through our Equality and Social Mobility Unit, Widening Access and Colleges Liaison teams. In 2017/18 we engaged with 35,000 young people through the delivery of 700 activities. The Community Fund is one way in which we 'give back' to local people, awarding grants to inspiring projects that seek to make a big difference to people and benefit the community in some way. Since its launch in 2014 we have donated more than £60,000, which has provided support to 35 good causes and initiatives across the county. Each year we throw open our doors and welcome thousands of people to our annual Community Day. Run by university staff, visitors to this free event have the chance to take part in activities including arts and crafts, climbing walls, inflatable assault courses, robotics, science experiments, 3D printing and much more. We host an annual Volunteering Fair which provides an opportunity for organisations to recruit motivated volunteers and to network with other charities and not-for-profit organisations. Our students receive recognition for the volunteering they do while at the University through our Futures Award, which recognises students for their engagement in volunteering with an internal or external host. The award is designed to help students to make the most of their volunteering experience, reflect and articulate the skills they develop and their relevance to future employment opportunities. To build on the University’s commitment to supporting the community, we have also pledged that 25,000 hours of volunteering will be ‘given back’ through the launch of a university-wide Community Volunteer Programme.